Description: The #460 Suzie Seal was replaced in 1965 with the #621 Suzie Seal. They look at the same at first glance, but the #621 has a bell on her chest that rings opposed to the #460's "arf-arf" sound. FPT2457 - Wooden cut-out seal with paper lithographs on the sides and edges of a black seal with white, blue, and pink flowers around her neck. 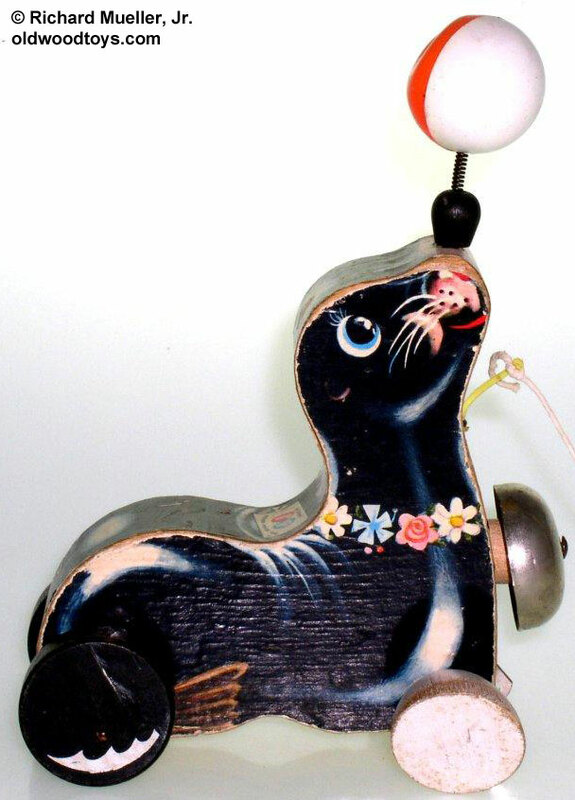 She balances a red and white plastic ball on the tip of her black wooden bead nose (attached via metal spring) and has a metal bell on her chest. The ball spins and bounces, the bell rings, and Suzie "waddles" when pulled. She rolls on 4 wooden wheels: 2 white teardrop/oval wheels on the front and 2 black wheels on the back that have blue heat-stamped "water waves" on one side. Measures 5-1/4" long, 4-1/4" wide and 6-3/4" high. *See "Variations" below. FPT4839 - Wooden cut-out seal with paper lithographs on the sides and edges of a black seal with white, blue, and pink flowers around her neck. She balances a red wooden bead on the tip of her black wooden bead nose (attached via metal spring) and has a metal bell on her chest. The ball spins and bounces, the bell rings, and Suzie "waddles" when pulled. She rolls on 4 wooden wheels: 2 white teardrop/oval wheels on the front and 2 black wheels on the back that have blue heat-stamped "water waves" on one side. Measures 5-1/4" long, 4-1/4" wide and 6-3/4" high. Also see 1961-1964's #460 Suzie Seal as she has no bell on the front of her chest. Also see 1964's #623 Suzie Seal as she balances an umbrella instead of a ball on the tip of her nose. Also see 1979-1980's #694 Suzie Seal.